This piece is as interesting as it is beautiful. It is reminiscent of Black Forest clocks of the mid-Nineteenth Century with a raised trellis of leaves and beams. A beautiful deer adorns the top along with grape leaves around the rest of the clock. This is a large and striking clock. The large wooden weights make the clock a centerpiece of attention. When the clock strikes the hour or half-hour the door opens, a cuckoo appears and calls along with the clock’s gong strike. This piece features wooden hands and numbers. Expressions of Time is an authorized Sternreiter dealer. This means you’ll receive an authentic Sternreiter clock, covered by the two year manufacturer’s warranty. 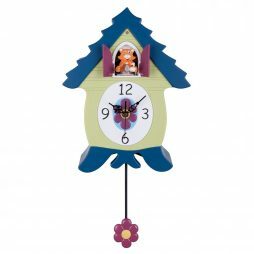 Crafted by the industry leaders, Sternreiter, this German Hand Carved Cuckoo Clock is an affordable and super-stylish clock for your home. It has a striking gold finish that will simply add a dash of sparkle to your walls. Also, the bright color of this telltale makes it perfect for almost any decor theme. 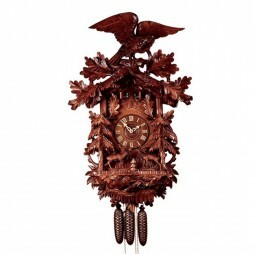 Carved from solid Linwood, this German clock is an exemplary piece that pops out a cuckoo with a deep resonating clock gong with the strike of each hour. Also, the shut-off switch makes it a very convenient wall clock to own. 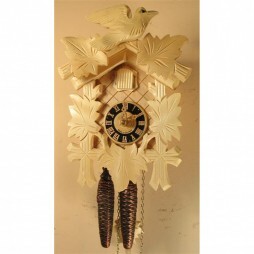 The opulent design and finish of this clock with add a glowing ambience to your home. 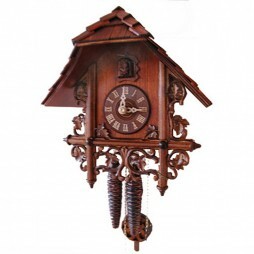 Carved with perfection and unmatched opulence, this Grand Forest 35″ Cuckoo Clock with 8 Day Movement is a spectacular telltale. We say so because this oversized clock features lovely scenes of the forest in one place. 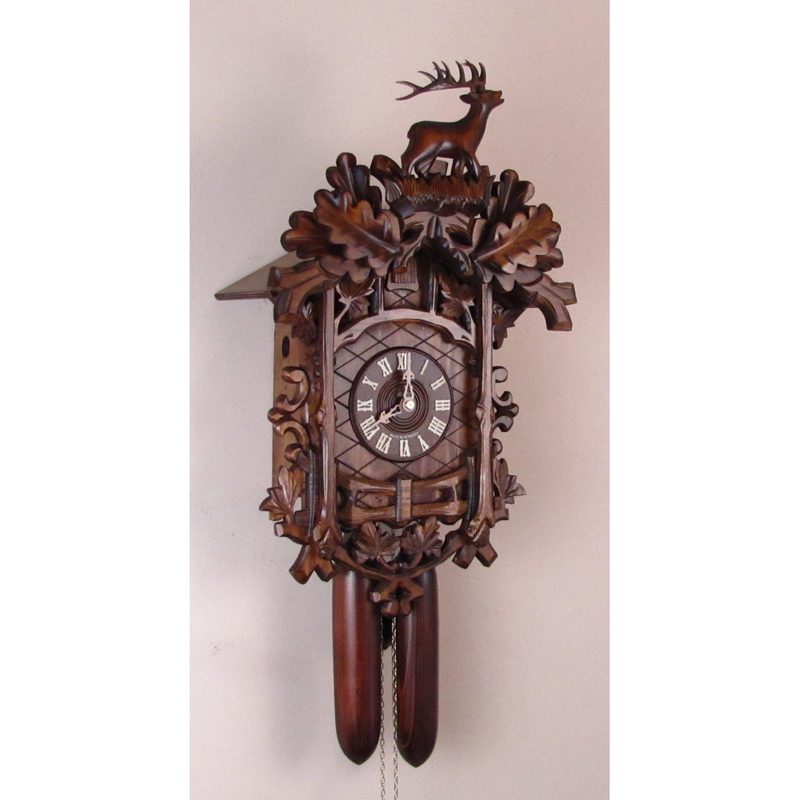 The carvings of this clock feature intricately designed oak leaves, deer, giant eagle, tiny acorns and pine trees. It is a musical teller of time that includes a music box from Reuge, Switzerland. The 36-note music box mechanism makes this clock way more special than any other that you may have come across. This pretty wall clock comes with a shut-off switch. It is a regal symbol of style that has the ability to add great charm to your interiors.